A solid financial plan can alleviate financial worries about the future and ensure that you will meet your financial goals—whether they relate to retirement, asset acquisition, education, or just vacations. I would encourage people to look at their overall situation no less than annually and assess the quality of the service they’re getting. Some discomfort is normal. You’re not going to gain anything without taking risks. But if you’re so nervous about the risk you’re taking that you cannot stay invested, you need to talk to your advisor. If you’re always buying at the top and selling at the bottom, you won’t build wealth. We need to be responsible for our financial futures. If you abdicate responsibility and say ‘So-and-so will take care of it’ you may find out when it is too late that so-and-so wasn’t taking care of it. I would be concerned if an accountant said ‘don’t worry about those details. Just trust me.’ People are entitled to understand what they are doing and why. Like dandelions in a spring lawn, credit card offers pop up everywhere--stuffing your mailbox, flashing on the Internet, even falling from the magazines in your doctor's waiting room. And they all sound so attractive. "0% APR until next year!" "No fee if you transfer a balance now!" "Low fixed rate!" You're thinking of applying for a card, but how do you decide which offer is best for you? Is there any validity to financial planning "rules of thumb"—such as "saving 10% of your gross income" or "needing 80% of your pre-retirement income to retire comfortably"? The following rules of thumb may work for some people. But they do not make financial sense for everyone. What’s important is to be able to know whether a rule suits your situation. Here are some of those rules, and some considerations that should not be overlooked. "Your life insurance should equal five times your yearly salary." This rule of thumb has been used to answer the question: How much life insurance should I have? The ideal amount of life insurance is the amount that will, when invested, generate enough income to allow your survivors to maintain the level of income they are used to. "Five times your salary" will accomplish this objective in some cases, but there is no substitute for making the calculations necessary to find out how much life insurance you in particular need to buy. The amount you need will depend on how many people there are in your family, whether there are other sources of income besides your salary, how old your children are, and other factors. Save 10% of your salary per year. You may need to save much more than ten percent of your gross income to have a comfortable retirement. The amount you need to save for retirement depends on how large your existing nest egg is and how old you are. Those who started saving late in life—in their 40s—need to save at least 15 or 20% per year. Contribute as much as you can to retirement plans. This makes sense for most people, but if you’ve accumulated a large amount of money in a retirement plan—close to a million dollars—you may reach the point where the negatives of contributing to your retirement plan savings outweigh the positives. You need 80% of your pre-retirement income to retire comfortably. Although people may need 80% of your salary during the first few years of retirement, later on they are often able to live comfortably on less. The amount of income you need depends on whether you have paid off your mortgage, whether you will have other sources of retirement income, and on other factors. Subtract your age from 100, and invest that percentage in stocks. This is one of those "cookie cutter" rules that only pans out for certain investors. For others, it results in a portfolio that is much too conservative. The best method of allocating your investments among various types of investments depends on your investment goals and needs, and your willingness to risk your capital. In this case, rules of thumb do not serve the investor at all. Maintain an emergency fund of six months’ worth of expenses. Depending on your family’s situation, three months’ worth of expenses might be enough of an emergency fund; or six months’ worth might be totally inadequate. The amount you should keep on hand depends on how easy it would be for you to take out a short term loan, and how much money you have in savings and investments, among other things. Tip: Do not rely on any rule of thumb to make financial decisions. Instead consider carefully what your needs and goals are, and calculate what you’ll need to do to fulfill them. A recent survey done by a Midwestern bank of 208 women revealed the following about the survey participants, who were all age 30 or older, and all or whom had incomes of at least $40,000. The median amount of monthly savings the women in the survey said was adequate was $475 – much less than what is needed to live out a comfortable retirement. 79% of the women said their investment style was moderate or conservative, as opposed to aggressive—yet some aggressiveness in investing is necessary to stay ahead of inflation. 31% of the women do not have a will, yet 49% believe their finances will be in order if they die unexpectedly. 26% said they have a poor or only fair understanding of their parents' wishes—making them ill-prepared to deal with the death of a parent. Because the law grants certain benefits and favors to married couples and not to unmarried couples, the latter must take certain steps in precautions in taking care of their financial planning needs. Here is an overview of the special considerations and problems that apply to unmarried couples, and what can be done about them. It is a good idea to seek out the aid of legal and financial professionals who are familiar with the issues faced by family units in which there is no legal marriage. They do not automatically inherit each other’s property. Married couples who do not have a will have the state intestacy laws to back them up: unmarried couples must have a will to see that their wishes are met. They do not have the right to speak for each other in a medical crisis. If your life partner loses consciousness or capacity, someone will have to make the decision whether to go ahead with a medical procedure. That person should be you. But unless you have taken care of some legal paperwork, such as a living will, you may not have the right to do so. They do not have the right to manage each other’s finances in a crisis. A husband and wife who have jointly owned assets will generally be affected less by this problem than an unmarried couple. Unmarried couples can also mitigate this problem by owning some property jointly. Yes. Contributions of $4,000 for each spouse are allowed if the couple’s wages or self-employment earnings are $8,000 or more. This rises to higher amounts after 2007. Withdrawals—if they qualify—are completely exempt from income tax, unlike all other retirement plans. Many can quickly build up their Roth IRA accounts by converting traditional IRAs into Roth IRAs—at a tax cost. You can’t contribute to a Roth IRA for a year with income above $110,000 if single or $160,000 on a joint return. You can’t convert a traditional to a Roth IRA with income above $100,000 (single or joint return). You must have earnings from personal services—$4,000 or more to make the (maximum) contribution - though an additional contribution of $1,000 is allowed persons age 50 and over. The $4,000 amount for earnings and contributions rises higher after 2007. Yes, subject to the income conditions above. This allows contributions of $4,000 each if the couple’s earnings are at least $8,000 after 2004; higher amounts after 2007. There’s never a deduction for Roth IRA contributions. You can re-characterize as in the preceding answer, so you don’t pay tax on asset values you no longer have. You can also adjust the inflation rate and your expected rate of return to see how these variables can impact your insurance needs. View the printable report for a year by year breakdown of your family's future income and expenses. If you refinance your mortgage, the process will be similar to what you went through in obtaining the original mortgage. In reality, refinancing a mortgage is simply taking out a new mortgage. You will encounter many of the same procedures and the same types of costs the second time around. In this Financial Guide, we will give you some pointers on how to get the best possible deal. How Would Refinancing Affect Your Tax Situation? Refinancing does not make good financial sense for everyone. A general rule of thumb is that refinancing is worth while if the current interest rate on your mortgage is at least two percentage points higher than the prevailing market rate. This figure is generally accepted as the safe margin when balancing the costs of refinancing a mortgage against the savings. However, a rule of thumb is not ironclad: every individual’s circumstances need to be analyzed. If your loan amount and the particular circumstances warrant it, you might choose to refinance a loan that is only 1-1/2 percentage points higher than the current rate. Talk to some lenders to determine the available rates and the costs associated with refinancing. These costs (explained further below) include appraisals, attorney's fees, and points. Once you know what the costs will be, determine what your new payment would be if you refinanced. You can then estimate how long it will take to recover the costs of refinancing by dividing your closing costs by the difference between your new and old payments. The fees described below are the charges that you are most likely to encounter in a refinancing. (Some of the costs are expanded on in the paragraphs that follow.) Because costs may vary significantly from area to area and from lender to lender, the following chart should be regarded only as an estimate. Your actual closing costs may be higher or lower than the ranges indicated below. Title Search And Title Insurance. This charge will cover the cost of examining the public record to confirm ownership of the real estate. It also covers the cost of a policy, usually issued by a title insurance company, that insures the policy holder in a specific amount for any loss caused by discrepancies in the title to the property. Points. Points are prepaid finance charges imposed by the lender at closing to increase the lender's yield beyond the stated interest rate on the mortgage note. One point equals one % of the loan amount. For example, one point on a $75,000 loan would be $750. The total number of points a lender charges will depend on market conditions and the interest rate to be charged. To give you the lowest rate offered, most lenders will charge several points, and the total cost can run between three and six % of the total amount you borrow. For example, on a $100,000 mortgage, the lender might charge you between $3,000 and $6,000. However, some lenders may offer zero points at a higher interest rate, which may significantly reduce your initial costs, although your payments may be somewhat higher. If you decide to refinance your mortgage, shop around by calling several lending institutions to ask each one what interest and fees they charge will help you get the best deal available. Also ask each about their "annual percentage rate" (APR) and compare them. The APR will tell you the total credit costs of the refinancing, including interest, points, and other charges. If you decide to apply for refinancing with a particular lender, and if you do not want to let the interest rate float until closing, get a written statement guaranteeing the interest rate and the number of discount points that you will pay at closing. This binding commitment, or lock-in, ensures that the lender will not raise these costs even if rates increase before you settle on the new loan. You also may consider requesting an agreement where the interest rate can decrease but not increase before closing. If you cannot get the lender to put this information in writing, you may wish to choose one who will. For a refinancing, the lender must give you a written statement of the costs and terms of the financing before you become legally obligated for the loan, as required by the Truth in Lending Act. You usually will receive the information around the time of settlement, although some lenders provide it earlier. Review this statement carefully before you sign the loan. The disclosure tells you the APR, finance charge, amount financed, payment schedule, and other important credit terms. When you apply for a mortgage, some lenders require you to pay a special charge to cover the costs of processing your application. The amount of this fee varies, but it may be $100 to $200. Usually, you must pay this charge at the time you file the application. Some lenders do not refund this application fee if you are not approved for the loan or if you decide not to take it. As you can see, many financial factors must be considered in refinancing a mortgage. Professional guidance is important in evaluating these factors. If you took out a mortgage to finance the purchase of your home, you are probably making monthly house payments. This house payment may include various costs of owning a home. The only costs you can deduct are real estate taxes actually paid to the taxing authority and interest that qualifies as home mortgage interest. Here are some nondeductible items that may be included in your house payment. Fire or homeowner's insurance premiums. You can deduct real estate taxes imposed on you. You must have paid them either at settlement or closing, or to a taxing authority (either directly or through an escrow account) during the year. If you own a cooperative apartment, special rules apply to the deduction, which is generally available to you. Tip: You and the seller each are considered to have paid your own share of the taxes, even if one or the other paid the entire amount. You can each deduct your own share, if you itemize deductions, for the year the property is sold. Delinquent taxes. Delinquent taxes are unpaid taxes imposed on the seller for an earlier tax year. If you agree to pay delinquent taxes when you buy your home, you cannot deduct them. You treat them as part of the cost of your home. Refund or rebate of real estate taxes. If you receive a refund or rebate of real estate taxes this year for amounts you paid this year, you must reduce your real estate tax deduction by the amount refunded to you. If the refund or rebate was for real estate taxes paid for a prior year, you may have to include some or all of the refund in your income. You must look at your real estate tax bill to decide if any nondeductible itemized charges, such as those just listed, are included in the bill. If your taxing authority (or lender) does not furnish you a copy of your real estate tax bill, ask for it. Assessments for local benefits. You cannot deduct amounts you pay for local benefits that tend to increase the value of your property. Local benefits include the construction of streets, sidewalks, or water and sewer systems. You must add these amounts to the basis of your property. If you own a cooperative apartment, some special rules apply to you, though you generally receive the same tax treatment as other homeowners. As an owner of a cooperative apartment, you own shares of stock in a corporation that owns or leases housing facilities. You can deduct your share of the corporation's deductible real estate taxes if the cooperative housing corporation meets certain conditions. Financial security derives not only from acquiring more money, but from planning. A solid financial plan can alleviate financial worries about the future and ensure that you will meet your financial goals—whether they relate to retirement, asset acquisition, education, or just vacations. The "Goals" section should state what you’d like to accomplish. Be as specific as possible, e.g., instead of writing "Acquire a bigger home," write "Acquire a home with at least 12 rooms in Anytown." The "Amount" needed should be an estimate of the amount of money you’ll need. For instance, to retire early, you might estimate that you’ll need a $400,000 nest egg by the time you reach age 50, or to buy a vacation home, you might estimate that you’ll need a $50,000 down payment. The "Target Date" section should include the approximate year—or, in the case of short-term goals such as a vacation in the current year, the month—in which you would like to achieve your goal. Fill out the personal statement of net worth below. This will enable you to estimate the value of everything you own, minus the value of your debts. When asked for a value, use what the property would fetch if you sold it today—its market value. Once you’ve completed the net worth statement, fill in the cash flow statement below. This will give you an estimate of what you earn per year—your salary, investment income, and retirement income—and what your current expenses are. To fill out this form, it will help to have on hand your check register and one year’s worth of credit card receipts. You should have a fund of three to six months—we’ll leave the number of months to your judgment--worth of living expenses to tide you over in case you lose your job or have unexpected bills. The emergency fund should be kept in an accessible account: a money market account is good for this purpose. Next, write in the the "Amount Still Needed." Then, fill in the "Years To Target Date", i.e., the year you want to achieve your goal. Finally, enter the "Intended Yearly Savings," the amount you need to save each year (the "Amount Still Needed" divided by the "Years To Target Date"). Come up with your financial profile. 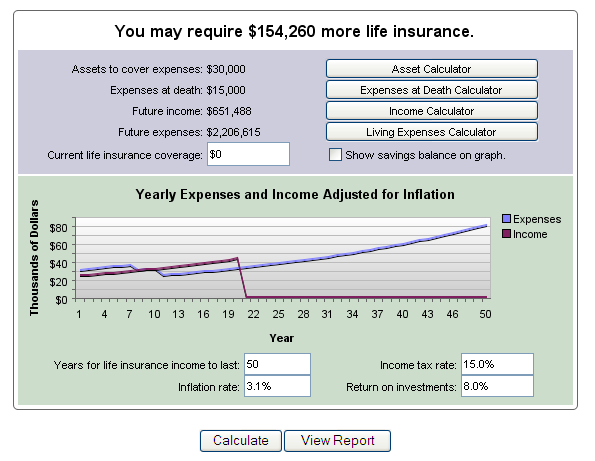 Your financial profile is the translation of your goals, risk threshold, and time horizon into a graph or curve, using a computer program. The three factors we just mentioned are plotted on a graph according to the program’s formulas. It’s important to use a good computer program because of the complexity of the task. The allocator’s goal now is to come up with the right blend of six or seven asset classes, in the right percentages, that will match your financial profile--your risk profile and time horizon.